Where is the coffee from?? ALL OVER THE WORLD. We source and roast the finest quality coffee beans from all around the world. We are dedicated to offering a selection of coffee from single origins to a unique range of blends. Is the coffee certified organic? Our organic blends, including the 'Little Friend blend' consist of 100% organic green beans, however being a smaller roastery we currently roast all the coffee through the same roaster so therefore they are not certified organic. Absolutely. Please submit a wholesale enquiry form or give us a call on 0424208861 if you are an interested wholesale customer. Orders over $50.00 are eligible to receive free shipping within Australia, and will be sent via Australia Post. Orders under $50 will be a charged a shipping fee of $9.00. We process orders from Monday – Friday and aim to have your order shipped within 48 hours of receiving the order, providing that the product is in stock at the time of ordering. Any orders placed over the weekend will be processed the next working day. Please note, for decaf orders, we roast to demand so this may take up to 72hours to process the shipment. Please find approximate delivery times from when the order is place. Other areas: 3-10 business days. What if I my order is damaged or broken? Please let us know if you have any complaints what so ever with your product. If it is damaged, or if you are in any way you are not happy with your product please let us know. We take pride in what we do and only hope to deliver you a quality product. All the information contained within all sections of the Flying West website (www.flyingwest.com.au) provides information for educational purposes only. While we take reasonable care in creating the information, Flying West makes no guarantees as to the accuracy, completeness or currency of any information on the site. Flying West are not liable to any individual or organisation for any loss or damage that may arise through the use of information contained in this site. 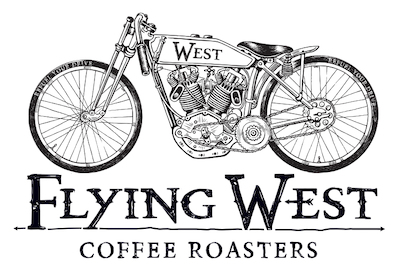 All features, content, specifications, products and prices of products on www.flyingwest.com.au are subject to change at any time without notice. The inclusion of any products or services on this site at a particular time does not imply or warrant that these products or services will be available at any time. Flying West takes all possible actions to protect your personal privacy. We only obtain personal information when you choose to give it to us or if it is essential in order to complete a product transaction. If we ever require more information to make your shopping experience more efficient and user friendly we will only do so with your consent. Flying West will not use or disclose any information about you without your consent. Flying West will not disclose your name, email address, postal address or any other directly identifying information relating to you with any third parties.